Some discoveries fade into obscurity, while other blaze a new trail the moment they’re published. More mysteriously, some research papers remain dormant for years before suddenly exploding with great impact on the scientific community. That second group, dubbed “sleeping beauties,” is the subject of a new study in the Proceedings of the National Academy of Sciences. A prime example is a paper by Albert Einstein, Boris Podolsky, and Nathan Rosen that laid out the “EPR Paradox,” a major puzzle in quantum entanglement theory in which particles with past interaction remain linked in their behavior no matter their distance, including across a galaxy. The new study finds that the paper, published in 1935, didn’t receive widespread citation until 1994. The drowsiest sleeping beauty in the study came from the influential statistician Karl Pearson. His paper that was published in 1901 in the journal Philosophical Magazine did not “awaken” until 2002. The top journals for the publication of sleeping beauties were PNAS, Nature, and Science. To calculate a paper’s “beauty coefficient,” the scientists compared a paper’s citation history against a line of reference based upon publication year, the maximum number of citations received in a year (within a multi-year observation period), and the year when maximum citation was achieved. They also calculated the “awakening time,” the year in which an abrupt change occurred compared to past citations. The new study also reveals that statistics, a discipline that had not been previously seen as rich in sleeping beauties, was among the top five fields to experience delayed citations, possibly due to the recent explosion in the availability of extremely large datasets. In addition to the study by Pearson, Flammini’s top 15 list included a paper from Edin Bidell Wilson, dormant for 70 years, that introduced an important formula for analyzing small datasets or calculating extreme probability. 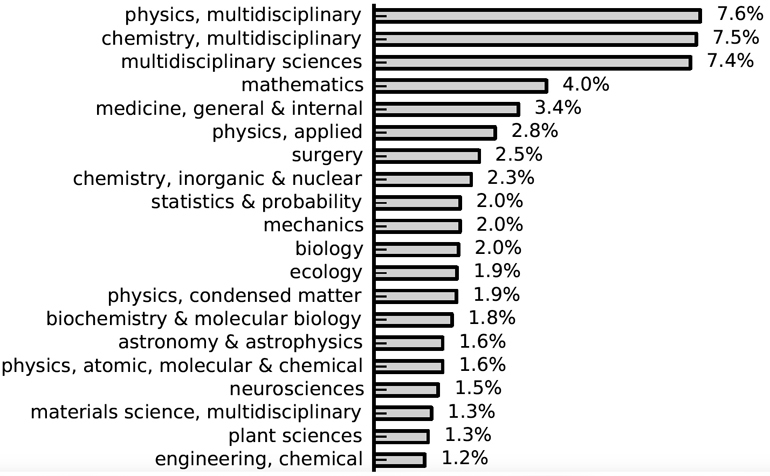 Other disciplines named for the first time among those experiencing delayed recognition were probability, surgery, and the social sciences. Broadly, Flammini says the greatest proportion of delayed recognition occurred in papers whose citations made the jump to a new discipline, with different scholars finding new resonances in their own fields. But sleeping beauties are also fickle, and defy easy definition. The study found no clear demarcation value separating them from “normal” papers, or a method to predict the timing or nature of renewed interest in their topics. The National Science Foundation contributed funding to the study.